The all-day tour from No Ka Oi Oahu Private Island Tours includes transportation in a luxury Porsche Cayenne, Chevy Tahoe, or Suburban (depending on the size of the party), cold water, lunch at Giovanni's Shrimp Truck, and stops, including Diamond Head Look Out, Blow Hole, Sandy Beach, Makapu Tide Pools, Waimanalo Beach Park, Lanikai Beach, Kailua Beach Park, Laniakea Beach (Turtle Beach), Sunset Beach, Waimea Bay, Historic Haleiwa Town, Ka'ena Point, and Dole Plantation. 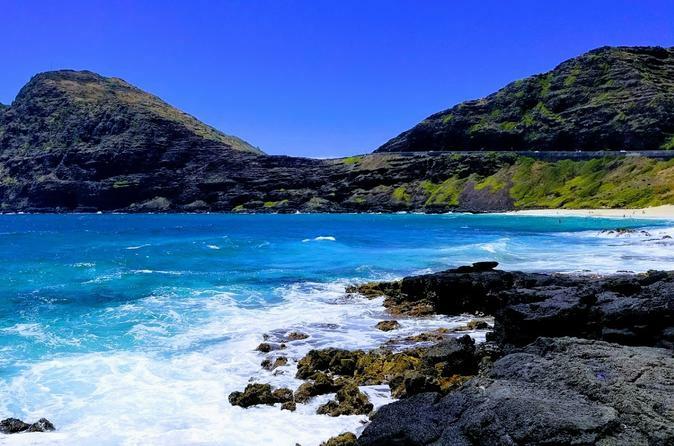 Our full Circle Island Tour includes but are not limited to Diamond Head Look Out, Blow Hole, Sandy Beach, Makapu Tide Pools, Waimanalo Beach Park, Lanikai Beach, Kailua Beach Park, Laniakea Beach (Turtle Beach), Sunset Beach, Waimea Bay, Historic Haleiwa Town, Ka'ena Point, and Dole Plantation. All tours are fully customizable so you can add or subtract any stop you wish. Remember this is your tour on your time. So if you want a day with some snorkeling time, no problem we can fit it in. We do pick-ups from all island locations between 7 and 9am and drop off about 8 hours later. We do run longer days depending on what you would like to ad to your tour.